Troubleshooting Radio Connection - NexSens Technology Inc.
1. First, make sure the COM port selected in iChart is correct. 2. Next make sure the base station is powered and operational. For a 4100-base, make sure the RS232 cable is plugged into the iChart computer and the AC adapter is plugged into a working AC outlet. 3. Next cycle the iSIC by removing the two fuses inside of the iSIC enclosure for a few seconds and then reconnecting them. After cycling the power, wait a few moments for the iSIC to restart and iChart to connect to it. 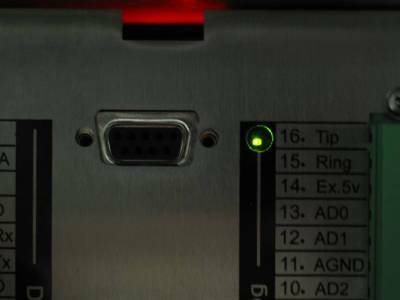 A green flashing light in the LED hole should be seen during restart. 4. Underneath the iSIC mounting plate is a spread spectrum radio modem. This modem has status lights that indicate if the modem has power, signal, etc. Inside of the 4100-iSIC enclosure, there will be radio lights on the top of the enclosure behind the iSIC plate. On the right hand side there should be a solid green light. This means that the radios can connect to each other. On the left hand side there should be a red blinking light; this is the radio signal strength. The faster the red light is blinking, the greater the signal strength up to a solid red light. 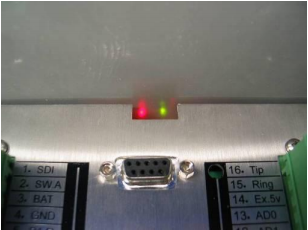 If there is no solid green light, then either the 4100-iSIC cannot communicate to the base station because of distance or antenna connection, or the base station is not powered or connected to the antenna.